Stanleys Bellochio contemporary glass collection features a faceted eye framed by four light Flutex glass panels and edged in dazzling diamond glass with patina caming. It provides an entryway that is dramatic while affording a high degree of privacy. You and your guests will be delighted with the sparkling interplay of reflections this 1/2 lite creates under a spectrum of lighting conditions. When only the utmost in sophistication and security will do, this design combines a tempered, acid etched back glass with intricately detailed ironwork. The result is a stunning decorative glass that is both beautiful and secure. PLEASE ALLOW 2-3 WEEKS FOR DELIVERY AS THE DOOR IS CUSTOM MADE. The look of hand-forged wrought iron on etched glass is a key feature of this unique silkscreened series. PLEASE ALLOW 2-3 WEEKS FOR DELIVERY AS THE DOOR IS CUSTOM MADE. 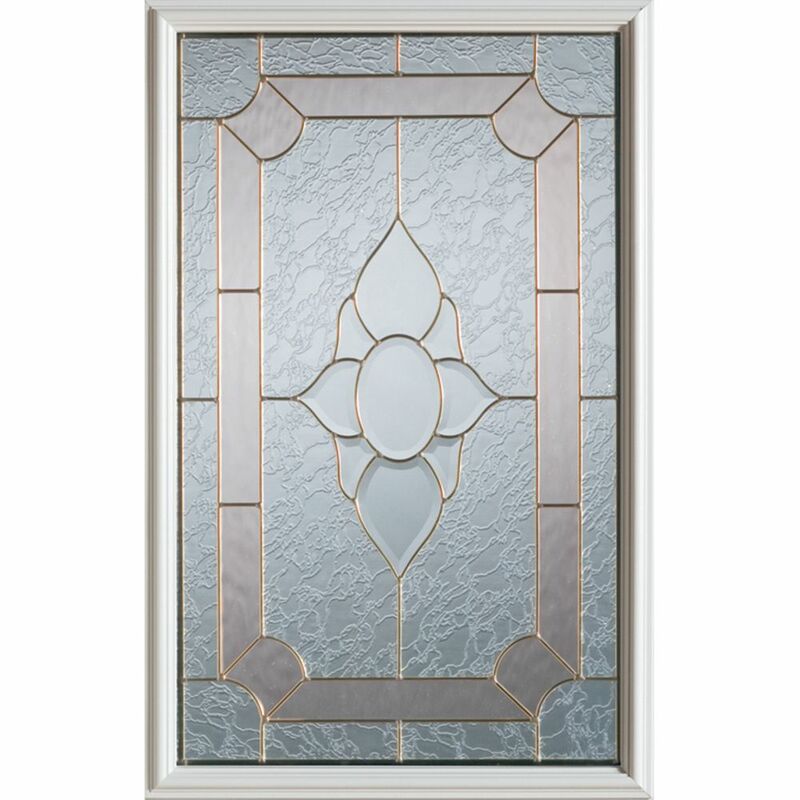 23 inch x 37 inch Rochelle Brass Caming 1/2 Lite Decorative Glass Insert A rich heritage can be found in this traditional stained glass profile. A distinctive look is created by surrounding a clear beveled central cluster with coloured and textured glass.